These Sheet Pan Fajitas with Beef are incredibly easy to make and will be ready for dinner in just about a half-hour. Serve with corn tortillas, or wrap them in lettuce for a healthier, low-carb option. If I had to pick one food to eat for dinner the rest of my life, I’m pretty sure I’d pick fajitas. You can’t go wrong with fajitas! They taste amazing, they’re versatile (chicken fajitas, beef fajitas, tilapia fajitas, shrimp fajitas), and they’re easy to make (even easier with this sheet pan version!). Plus, fajitas are an easy food to “lighten up.” Although I love a good fajita the “old-fashioned way” in a corn tortilla, I know that’s probably not the best choice every time. Fajitas can easily be made into low carb fajitas (or keto fajitas) by skipping the tortilla and opting for a lettuce wrap instead. I know I said fajitas are easy to make, but sheet pan fajitas are EASY to make. No cooking the onions and peppers separately and then adding the meat and cooking again. 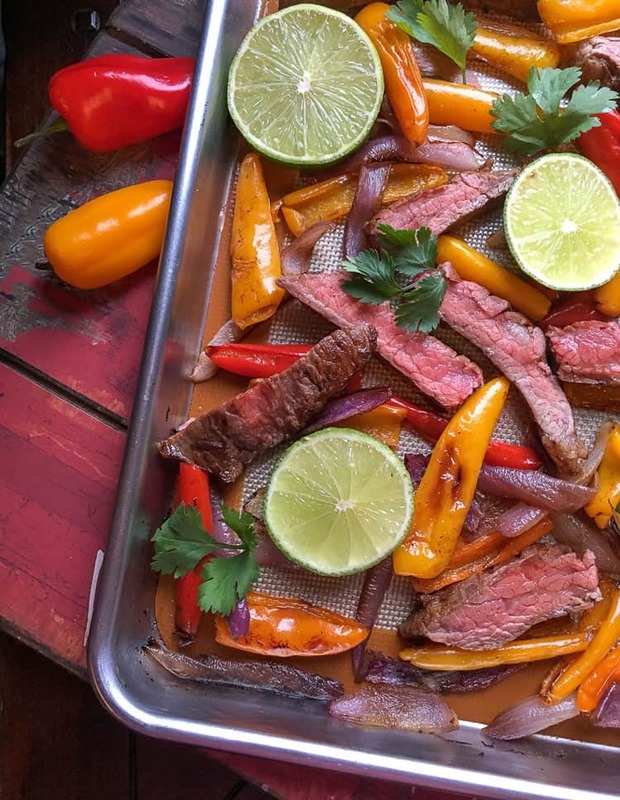 With this oven-baked sheet pan fajitas recipe, you just season everything, throw it on to a prepared baking sheet, pop it in the oven for 15 to 20 minutes, and you’re done. 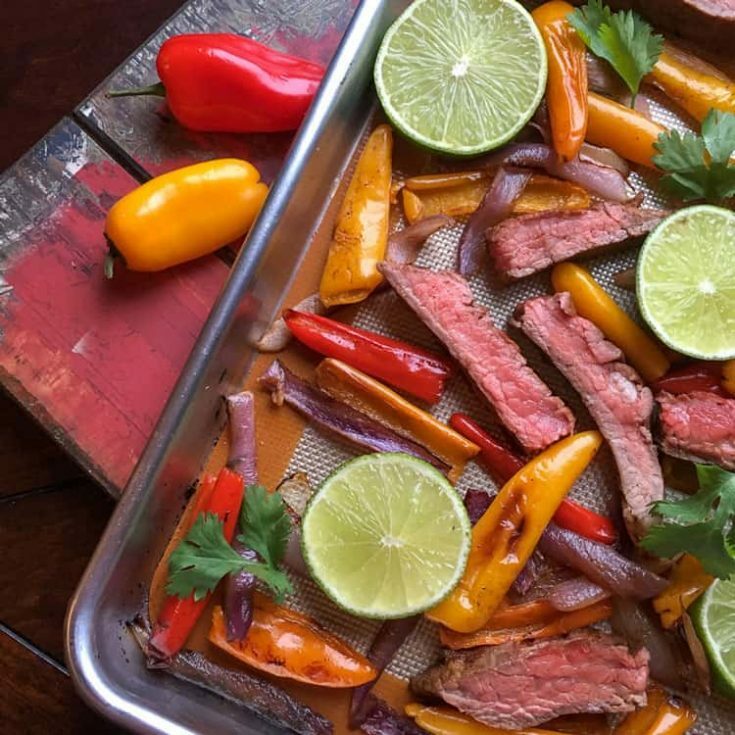 Sheet Pan Fajitas are already easy (everything roasted on one pan at the same temperature — it doesn’t get much easier than that! ), but I have a “secret weapon” that makes them even easier: a silicone baking mat. You don’t need to use cooking sprays, parchment paper, or oil. It will save you money — no more going through roll after roll of parchment paper! You can use it in the oven as well as the microwave, freezer, and toaster oven. 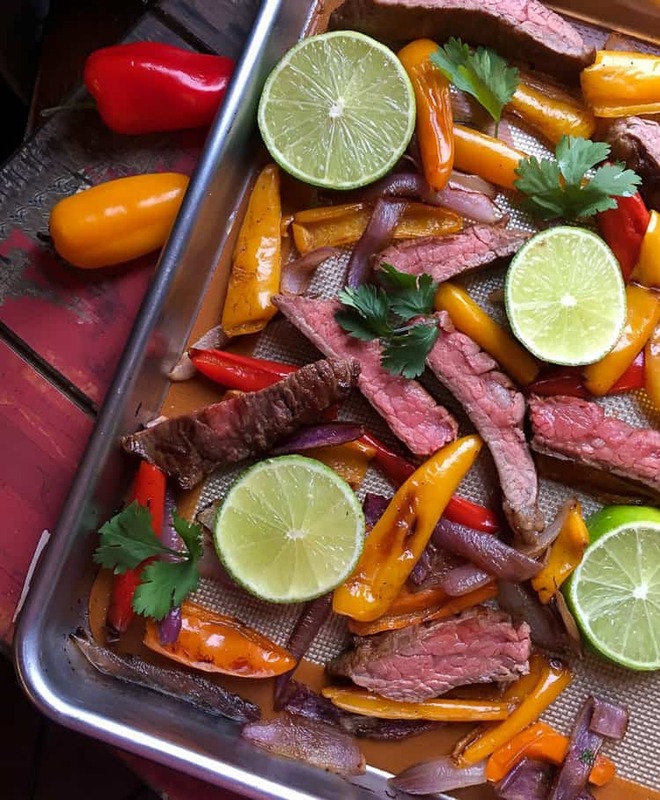 If you like these Sheet Pan Fajitas with Beef, how about two more fajitas recipes? Tilapia Fajitas with Peppers and Onions: These delicious tilapia fajitas contain only 6 Weight Watchers Smart Points, making them an excellent healthy dinner. Chicken Fajita Lettuce Wraps with Creamy Cilantro-Lime Sauce: These fajitas skip the tortillas and are served in romaine lettuce wraps. The cilantro-lime sauce is incredibly flavorful and completely fat-free! I hope you enjoy this easy and healthy Sheet Pan Fajitas dinner! Sheet Pan Fajitas with Beef are easy, fast, and full of flavor! Line a large, rimmed baking sheet (for best results, use a three-quarter sized sheet pan) with a Silpat® baking mat (recommended) or parchment paper. Preheat oven to 400°F. Combine flank steak, peppers, red onion, olive oil, cumin, chili powder, cayenne, and red pepper flakes in a large bowl. Season generously with salt and pepper to taste. Mix until everything is well coated. Spread the pepper and steak mixture onto the baking sheet. Make sure everything is in an even layer with little to no overlap. Roast in the oven for 15-20 minutes, or until the peppers have softened and slightly caramelized and the steak reaches the desired doneness level. Remove sheet pan from oven. Sprinkle with fresh cilantro and a squeeze of lime juice. Serve immediately with avocado (optional) and either corn tortillas or lettuce wraps. The nutrition facts have been calculated without the optional avocado and corn tortillas. If you eat your sheet pan fajitas with one or both optional items, keep that in mind when you look at the nutrition facts.